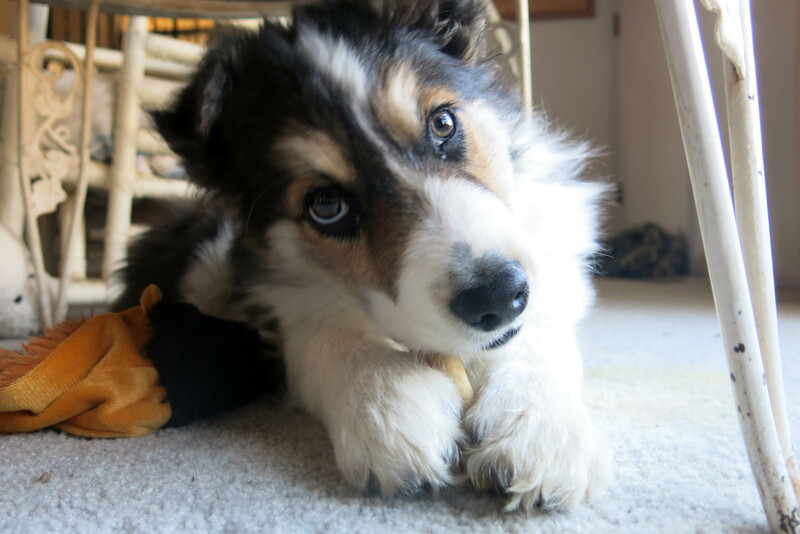 Hello everyone; yes, once again it is I, Mani the purebred border collie, filling in for the guy I live with, and here to tell you all about my day. You may remember me from such posts as “Cabin Fever”, among at least a few others. Here I am in a characteristic pose. It was really melty and drippy today, and I got to play out in the slushy snow and muddy mud, and that was fun. I went over to another neighbors’ house to introduce myself, took some naps, and played with my toys. The toys were left by the purebred border collie who lived here before me, and it was almost like he knew I would be needing all these toys. I like them a lot. I also like chomping on the guy I live with, which is why he now calls me Mighty Bitey. I know I’m not supposed to be doing that, but when I see him, it seems like he’s one of those people who’s here just to be chomped. Maybe you know what I mean. His shoelaces come untied about once every minute, and that’s surely an invitation for me to pounce. Stuff is happening. That’s about how I can sum it up. I don’t find it all that exciting, but he does, and so I’m going to talk about it now. 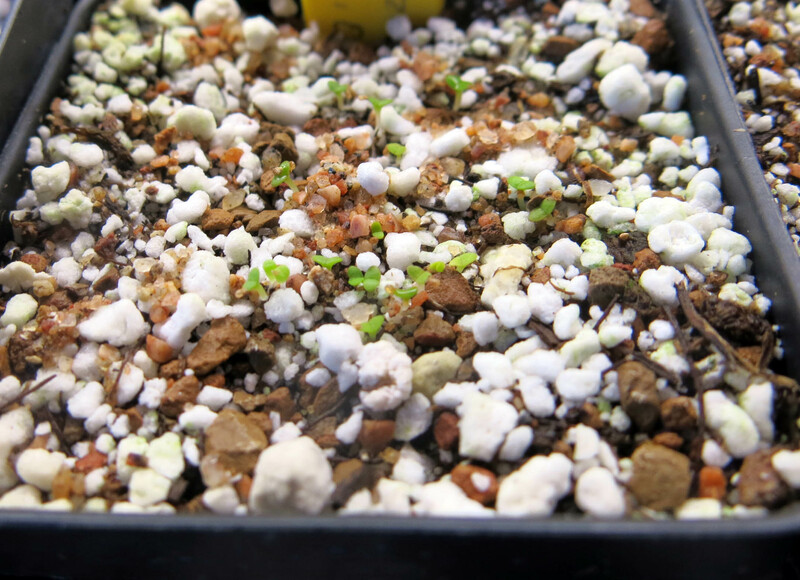 He sowed some seeds of Titanopsis calcarea (you know, the plant that looks like a rock) a couple of days ago and look what’s happened. The seeds didn’t get as evenly sown as he thought, I guess. And bunches of agaves are coming up too. This picture was taken through the plastic of the “nanodome”, which is why it looks weird. 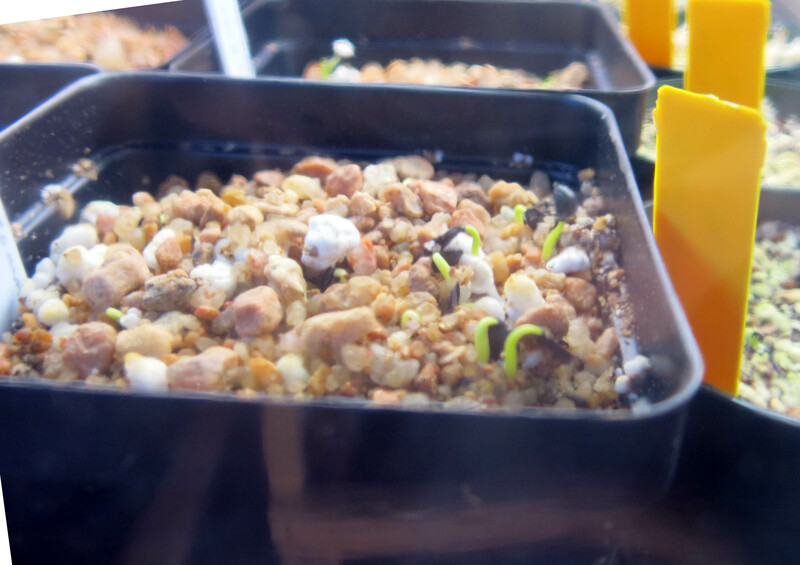 The seeds come up in a couple of days. “Very gratifying” he says, and since I know I don’t like waiting for anything, I think I can sympathize. Out in the garden, there are some irises in flower. The first one is from a mountain in Iran. The guy I live with says we aren’t going there to collect seed, even though the climate, in parts anyway, is similar to this one. I was glad when I heard that. I don’t think I would be very good at collecting seed. The color, by the way, is a little off. He doesn’t know why the point-and-shoot camera does this, but it does. There’s other stuff going on, but I wasn’t much interested in it. One thing that happened today was pretty interesting, though. The guy I live with said we might meet some time, not getting too close, but I’m not so sure. The guy I live with said that was either Pearl or Merle; he wasn’t sure. She was really angry that I was looking at her. Oh, and see how scratched the sliding glass door is? That was done by the first border collie who lived here. He would get scared by thunder or fireworks, which I hear can be scary, and would scratch at the glass to get in. There’s no point in wondering why the door never got replaced. The guy I live with says it’s called “shabby genteel”, which sounds to me like an excuse for never having done something about it. A friend came over to meet me, and I got lots of cuddles and attention, and when we all went outside, I ran around, and didn’t come when I was called, which, if you didn’t know, is what you do when you’re little. It was actually kind of an exhausting day, and so at the end I found a chew stick and chewed on that for a while. That’s a new toy I got, there next to me. It has a squeaker at each end. Pretty deluxe. I’ll let you go now. I have much more chewing to do. 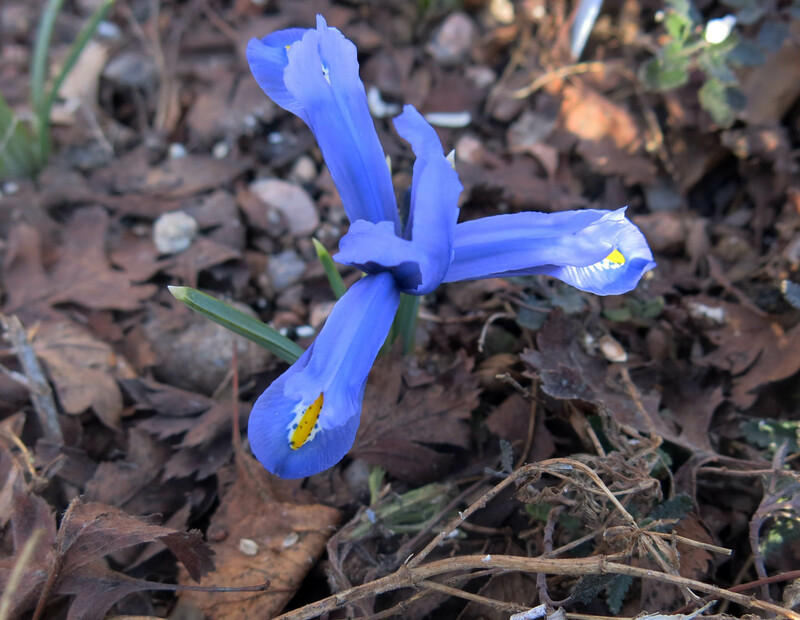 This entry was posted in Uncategorized and tagged border collies, Iris hyrcana, Iris reticulata, Titanopsis calcarea. Bookmark the permalink. Oh we have one of those Pearl-Merle creatures here, her name is Monica. In fact there are more than one, and I named all of them Monica. Monica eats the birdseed , and Ted and Doobie (who are cats) just watch her do it. They aren’t young like you so they are ineffective at chasing things. Really good at sleeping though. Have you gotten cuter in the last couple of days ? Thanks; you know, it’s quite possible that I’m getting cuter. I didn’t think that could happen, but maybe it can. I didn’t have a chance to go after anything today because the guy I live with said he had to put on his “waterproof paws” in order to go out in the slush, and that would have taken too much time. My paws are waterproof and I thought that was silly. What? Tell him to just stick his feet in the boots. How hard? Really. Go after anything, Mani, in the slush! He’s old, and slow. Not like incredibly nimble me. Oh, your cutesiness, this post came just in time. We leave shortly for our favorite bistro, and you have rescued me from paltry talk, never a good match for steak tartare. I can talk about Mani’s excellent exhausting day, and the photos which document the doings. 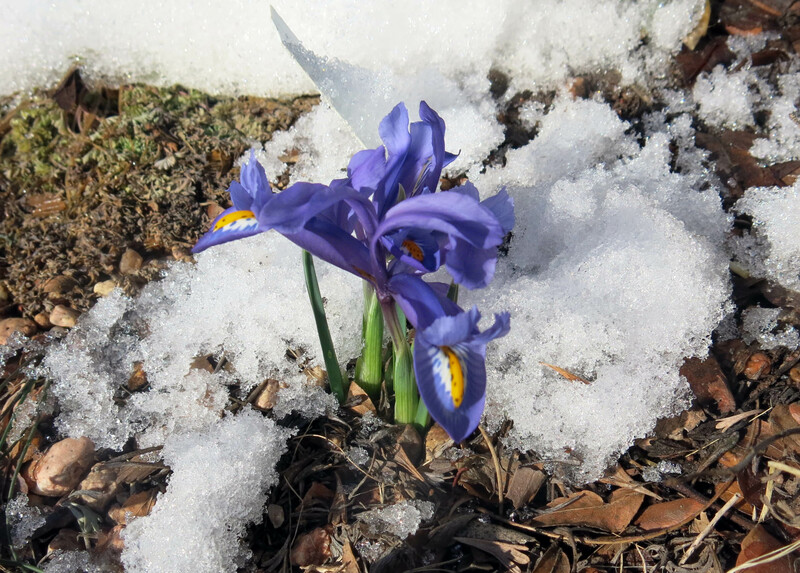 Some exclaiming about (suspect) blue Iris reticulata Kuh-e Abr against the snow might happen too. 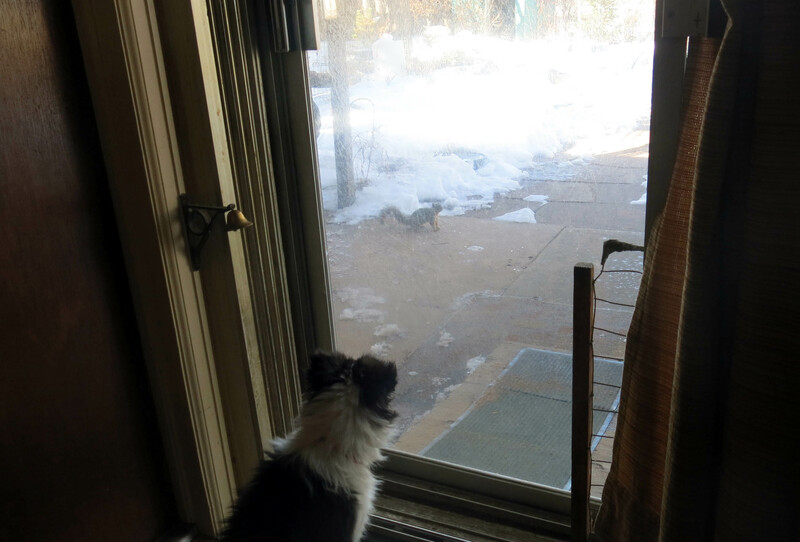 And, of course, “did you see the size of that squirrel? Humongous!” Thank you for providing with the last portrait my new screen saver. Did ever a dog have a more excellent day? Well, you know, if I got left alone, with the run of the house, there are a couple of chairs that have too much stuffing in them, and some books that could be chewed to pieces, so ….. The iris actually is actually bluer than the picture shows. I can see blue. Though I don’t care so much about the iris. The squirrel was pretty big. Well, it’s practically all we talk about here, too. 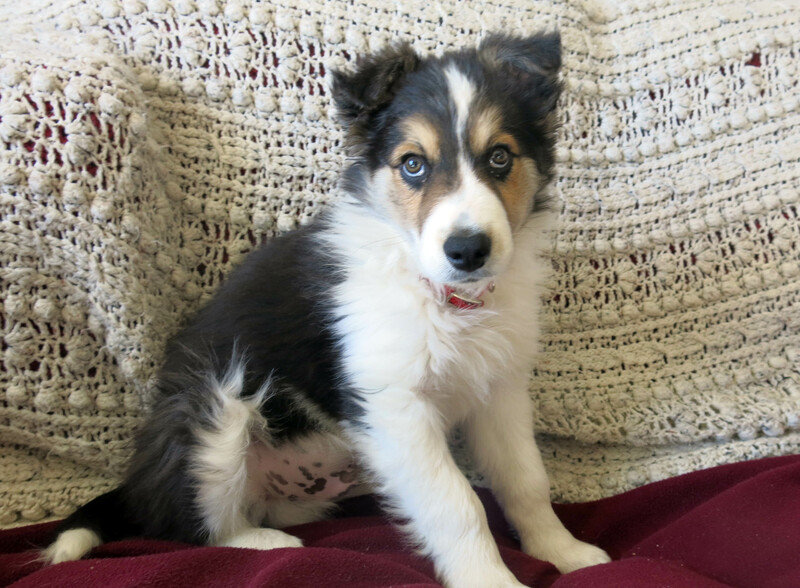 You seem to be settling in very well, just don’t overdo it with all the chewing and chasing and stair climbing! -but it does seem to be making you cuter, if you even thought that was possible. Thanks; I have an excellent role model for doing next to nothing, you know. Thanks for the iris pictures, but especially for the cute pics of you. Don’t bite the guy too hard, now. He still has lots of seeds to plant, I bet. Oh, another package from Mesa Garden came yesterday. I understand that this bunch of seeds will wait until later in the year, though. Love seeing some color in snow like that blue. looks like lots of fun things to see out in that yard. Gray things that move and climb trees. we made the mistake of chaising off twelve gray things one summer that were breaking the bird feeders and now our Annie thinks it’s her duty to keep them out of the feeders. But the birds she just lays by. So just make sure the guy you live with doesn’t accidently train you to chase them unless he wants them gone like the bunnies. 🙂 Enjoy those fun toys. The toys are excellent, thanks. 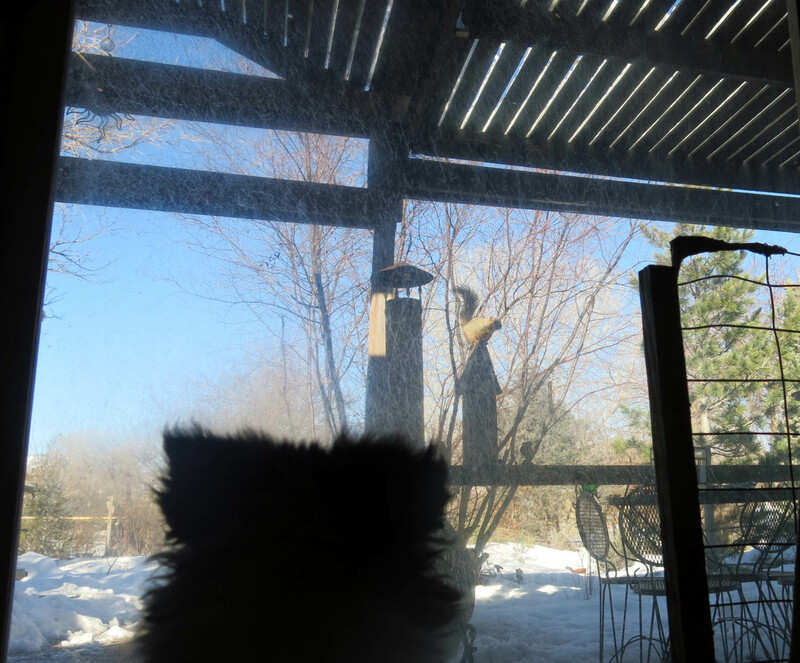 Two of the bird feeders are armored and so only birds can get to them, and not the big scary birds either. The little ones. I think I’ll be pretty good at chasing bunnies around the garden, or maybe just herding them. We have a bird house in a tree. It was placed much too high by the previous owner and we can’t get to it. Well, I was watching in a recent windstorm, the tree was shaking, and the bottom of that house opened up just like a mailbox. Guess what popped out and ran off? Two rats. I’d rather have Merle Pearl Earl any day. Our yard is quite the habitat so what to do? Nothing I guess. We have no border collie to protect us. Rats, ick. We have pack rats here, and they collect stuff. The guy I live with says that humans who collect stuff are often the most interesting people, but pack rats aren’t that interesting. Though they are pretty cute. It sounds to me like a bottomless bird house won’t be used much. No, but he looked at it. 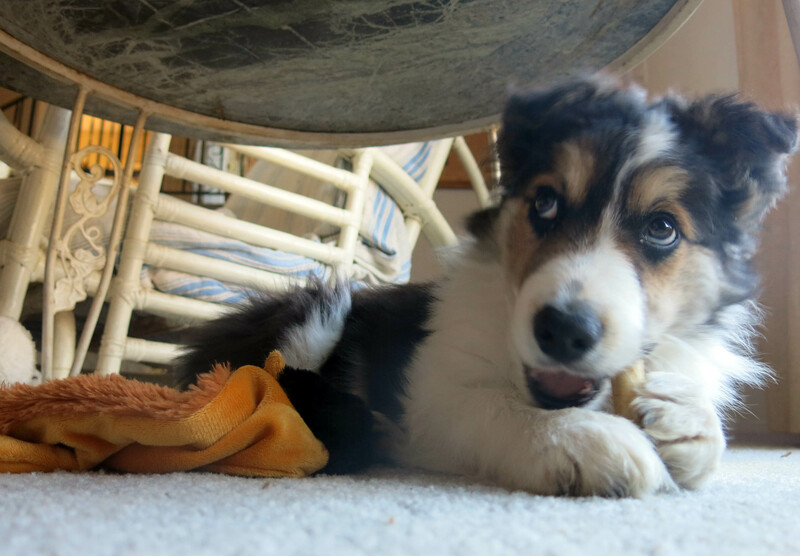 I can’t even find my chew deal five minutes after I get it…. Hope your mum feels better.